For the film, see Princess Caraboo (film). 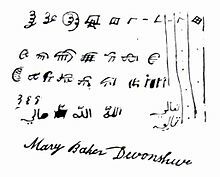 Mary Baker (née Willcocks; 11 November 1792 (alleged), Witheridge, Devonshire, England – 24 December 1864, Bristol, England) was a noted impostor. Posing as the fictional Princess Caraboo, Baker pretended to be from a far off island kingdom. Baker fooled a British town for some months. On 3 April 1817, a cobbler in Almondsbury in Gloucestershire, England, met an apparently disoriented young woman wearing exotic clothes who was speaking an incomprehensible language. The cobbler's wife took this stranger to the Overseer of the Poor, who placed her in the hands of the local county magistrate, Samuel Worrall, who lived in Knole Park on the estate where Tower House is located. Worrall and his American-born wife Elizabeth could not understand her either; what they did determine was that she called herself Caraboo and that she was interested in Chinese imagery. They sent her to the local inn, where she identified a drawing of a pineapple with the word 'nanas', meaning pineapple in Indonesian languages, and insisted on sleeping on the floor. Samuel Worrall declared she was a beggar and should be taken to Bristol and tried for vagrancy. During her imprisonment, a Portuguese sailor named Manuel Eynesso (or Enes) said he spoke her language and translated her story. According to Enes, she was Princess Caraboo from the island of Javasu in the Indian Ocean. She had been captured by pirates and after a long voyage she had jumped overboard in the Bristol Channel and swum ashore. The Worralls took Caraboo to their home. For ten weeks, this representative of exotic royalty was a favourite of the local dignitaries. She used a bow and arrow, fenced, swam naked and prayed to a god, whom she named Allah-Talla (a spelling variation of Allah Ta'ala, one of the formal names for God in Islam). She acquired exotic clothing and her portrait was painted and reproduced in local newspapers. Her authenticity was attested to by a Dr. Wilkinson, who identified her language using Edmund Fry's Pantographia and stated that marks on the back of her head were the work of oriental surgeons. Newspapers published stories about Princess Caraboo's adventures bringing her national acclaim. Eventually the truth surfaced. A boarding-house keeper, Mrs. Neale, recognised her from the picture in the Bristol Journal and informed her hosts. This would-be princess was in truth Mary Willcocks, a cobbler's daughter from Witheridge, Devon. She had been a servant girl around England but had found no place to stay. She invented her fictitious language from imaginary and gypsy words and created an exotic character and story. The odd marks on her head were scars from a crude cupping operation in a poorhouse hospital in London. The British press made much of the hoax at the expense of the duped rustic middle-class. 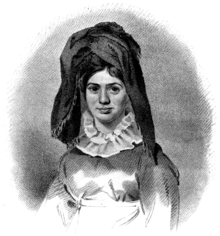 Mrs. Worrall took pity on her and arranged for her to travel to Philadelphia, for which she departed in 28 June 1817. On 13 September 1817 a letter was printed in the Bristol Journal, allegedly from Sir Hudson Lowe, the official in charge of the exiled Emperor Napoleon on St. Helena. It claimed that after the Philadelphia-bound ship bearing the beautiful Caraboo had been driven close to the island by a tempest, the intrepid princess impulsively cut herself adrift in a small boat, rowed ashore and so fascinated the emperor that he was applying to the Pope for a dispensation to marry her. That story is unverified. In the USA, she briefly continued her role, appearing on-stage at the Washington Hall, Philadelphia, as 'Princess Caraboo', with little success. Her last contact with the Worralls was in a letter from New York in November 1817, in which she complained of her notoriety. She appears to have returned to Philadelphia until she left America in 1824, returning to England. In 1824 she returned to Britain and exhibited herself for a short time in New Bond Street, London, as Princess Caraboo but her act was not successful. She may have briefly travelled to France and Spain in her guise, but soon returned to England. In September 1828, she was living as a widow in Bedminster under the name Mary Burgess (in reality the name of a cousin). There she married Richard Baker, and gave birth to a daughter named Mary Ann the following year around 1829. In 1839, she was selling leeches to the Bristol Infirmary Hospital. She died from a fall on 24 December 1864 and was buried in the Hebron Road cemetery in Bristol. Her daughter carried on with her business, lived alone in Bedminster in a house full of cats until her death in a fire in February 1900. The hoax provided material for a script, filmed in 1994, Princess Caraboo, written by Michael Austin and John Wells, which added some fictional elements to the story. A novel by Catherin Johnson based on her life was published in 2015. Several stage musical adaptations have been attempted based on the story of Princess Caraboo, including a 2004 workshop starring Laura Benanti, Caraboo. A full stage musical, Princess Caraboo, opened on 30 March 2016 at London's Finborough Theatre, with a book and lyrics written by Phil Willmott and composed by Mark Collins. The limited-run production opened to positive reviews, earning Best New Musical and Best lighting design nominations at the Off West End Theatre Awards. ^ a b Baring-Gould, Sabine (1908). "Caraboo". Devonshire Characters and Strange Events. London: John Lane. pp. 35–47. ^ X, Mr. "Caraboo: A Hypertext Edition of John Matthew Gutch's Narrative". www.resologist.net. Retrieved 9 April 2018. ^ "The Times". 6 June 1817: 4. ^ Anonymous (1817). Carraboo, Carraboo. The singular adventures of Mary Baker, alias princess of Javasu. London. ^ Sitwell, Edith (1958). English Eccentrics. Penguin. ISBN 0140032738. ^ "The History Press | The mysterious Princess Caraboo". www.thehistorypress.co.uk. Retrieved 9 April 2018. ^ "Mary Baker - The Princess Caraboo - Geri Walton". Geri Walton. 5 November 2014. Retrieved 9 April 2018. ^ "Princess Caraboo from the Island of Javasu". Jane Austen. 17 July 2011. Retrieved 9 April 2018. ^ Johnson, Catherine (2015). The Curious Tale of the Lady Caraboo. London: Corgi Books. ISBN 9781448197583. Wikimedia Commons has media related to Princess Caraboo. Princess Caraboo: Article at the Museum of Hoaxes. This page was last edited on 29 March 2019, at 11:51 (UTC).